In May 2016 Al and Micki Lees watched their only daughter cross the stage beneath the Castleton Pavilion to receive her bachelor's in health science. That summer they witnessed Amber transition into the professional world as a pharmaceutical representative in dermatology for Bayer HealthCare with territories in the Queens, Long Island, and the Greater New York City Area. Six months later they found themselves on a family vacation in Park City, Utah, 2,138 miles from home, forced to answer questions about her wishes concerning life support. “I remember thinking, ‘I’m so sick, I feel like I’m going to die,’” Amber said. 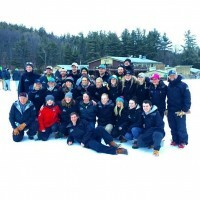 An alumna of the Castleton women’s alpine ski team, Amber said she has dedicated nearly every winter to her ski racing career, and the last four to competing at the collegiate level. Because of the time required to prepare and perform at this level, the Lees family was never able to take advantage of holiday breaks together. Seizing the opportunity this year, Amber surprised her parents and brother, Tyler, with an all-expense paid week-long ski trip to Park City. Despite ringing in the New Year with the stomach bug, Amber and her family took flight for their dream vacation on Jan. 3. An hour after the plane touched down Amber said she noticed a rash on her lower legs and wasn’t feeling well. A trip to the local medical clinic identified the symptoms as a virus but advised her to visit an emergency room if she experienced any changes. After a full day of rest confined to her hotel room, Amber said she awoke on Jan. 5. with grey skin, swollen extremities, and in excruciating pain. A trip to the Park City ER quickly became a Medvac to the University of Utah Hospital in Salt Lake, where, in the Intensive Care Unit, Amber became a clock race for seven separate teams of doctors. The tests continued to come back negative as her blood turned toxic with lactic acid levels that soared as high as 6.3 from the normal 0.0.-1.0 range. As her body declined from a Staph aureus infection, to toxic shock syndrome, to sepsis, to septic shock, and finally to kidney, liver, and lung failure, Amber said the doctors elected to put her into a medically induced coma. “They said my chances of surviving through the first night were about 10 percent,” she said. Amber spent a week in the coma before doctors were able to identify the source as a highly aggressive Staph infection that had settled into her spine and left eye. The infection had led to Acute Respiratory Distress Syndrome, ARDS, which triggered her organ failure and caused her lungs to begin filling with blood. With this breakthrough Amber’s fight transitioned to an upward climb. At first she responded only to painful stimuli, but when the doctors asked the semi-conscious Amber to show them how to do moguls, she began to move her feet. From that point she quickly made progress coming out of the coma. Amber said she's especially grateful for the support she and her family have received from the Castleton community. A true 21st century response, Eder said the group took to social media. Eder said the team also opted to dedicate their season to Amber and found it an easy choice to represent their former teammate with hair bows and Duct Tape, after her signature race day bows and notorious love of Duct Tape that’s confirmed by her custom license plate which reads: DUCTAPE. 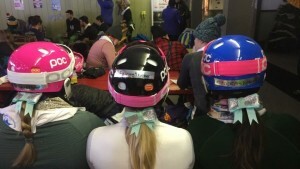 Eder added that as word spread around the mountain about Amber many athletes and coaches from other schools began asking the Castleton alpine team for extra bows to show their support. According to Amber the hashtags, #Racing4Amber and #AmberStrong, went viral and the social media support she experienced was more than she ever imagined. 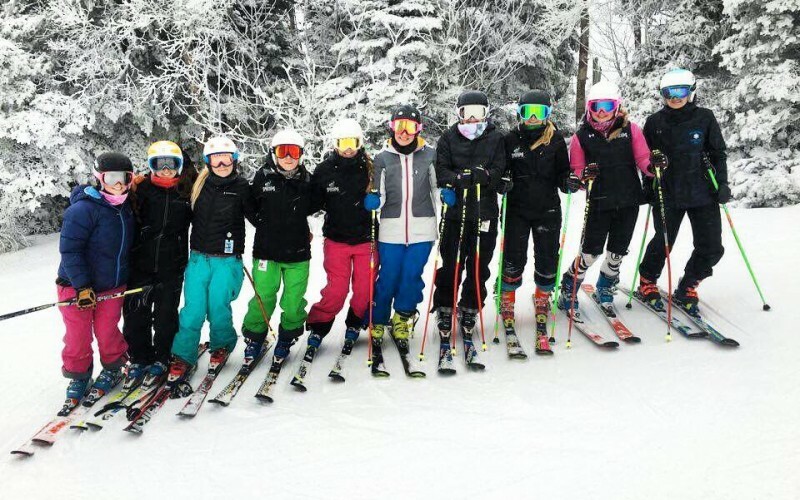 She even began receiving videos on Facebook wishing her well from the US National Ski Team. “It’s amazing how many people came together for me. I have the most amazing friends in the world,” she said. Beyond the hashtags, Castleton women’s soccer alumna, Mallory Costello, created a GoFundMe page for Amber that exceed its goal of $10,000 and raised more than $22,000 to help her family with hospital bills and hotel stays. Many others made the trek to Salt Lake to visit Amber and her family. After his Jan. 13 race, senior men’s alpine and All-American, Matt Couture, boarded a plane to see his former teammate for a few days. 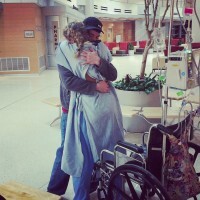 While Amber was in the coma former Spartan, Ben Hannah was vacationing in Utah and visited her family at the hospital. Despite a nine hour drive through a snow and ice storm, men’s alpine alumnus Patrick Burke also made the trip to comfort the Lees family. A former Spartan dual athlete on the women’s alpine ski and soccer teams and now a Utah resident, Blaire Hooper visited the hospital every day to bring the family food and fresh clothes. “You don’t realize how many people you have in this world,” said Amber. After two and half weeks in the hospital, Amber and her family are now home in New Jersey, where she is still battling the infection with a five week IV antibiotic regiment and in-home physical therapy. As a result of damage to her cranial nerve six, Amber is still experiencing double vision in her right eye, but is expected to make a full recovery. While still in recovery in Salt Lake, Amber said her dad asked her what it was like to be at her own funeral.